Earlier this month I published my latest Constellation Research report, Enterprise Collaboration Software: From Simple Sharing to Purposeful Collaboration. This report covers the evolution of collaboration platforms, showing how they have grown from stand-alone tools used primarily for sharing news and status updates, to platforms supporting the integration of external data for business use, to enterprise business applications that now have social features built right in and are designed to support specific use-cases. 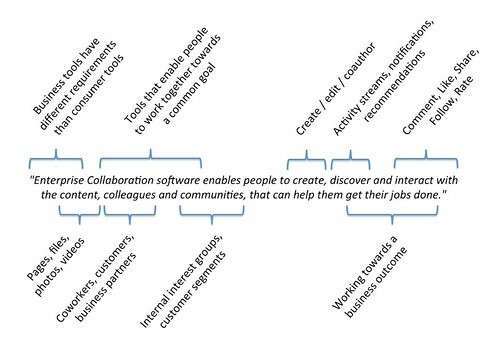 An in-depth look at the definition of Enterprise Collaboration Software: "Enterprise Collaboration Software enables people to create, discover and interact with the content, colleagues and communities that can help them get their jobs done." Purposeful Collaboration Will Drive the Greatest Business Value: Constellation expects these purposeful collaboration platforms to make impact in: Sales, Marketing, Human Capital Management, Customer Engagement, Development/Engineering, Resource or Supply Chain Management and Business Operations. The report also includes, The Road Ahead: Reducing Information Overload, which discusses one of the major hurdles people face when using social software. Please contact me for more information on Purposeful Collaboration, including questions about Constellation's services and workshops on the topic.